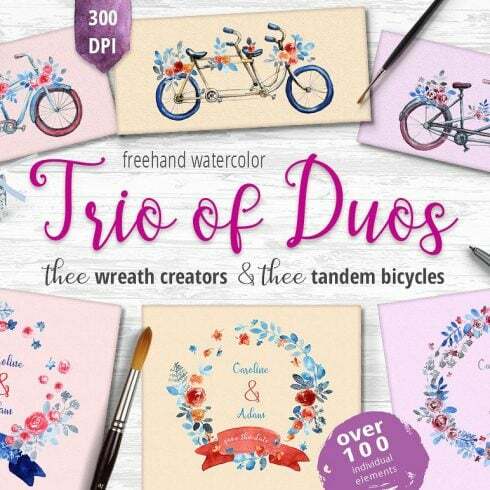 We are glad to present you gorgeous Trio of Duos: 3 Wreath Creators and 3 tandem bicycles! Together they make up three watercolor collections. 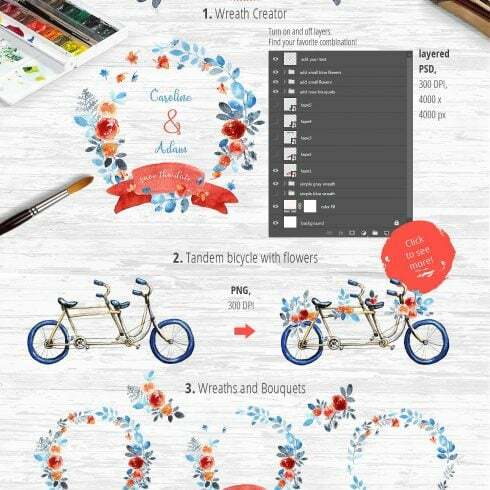 Colors are chosen so that you can combine wreaths and tandems in different ways, creating new accents. Each of the Collection includes hand painted floral elements and tapes, created with gentle shades of watercolor. You will find inside three freehand Watercolor Collections. 6 individual layers used in Wreath Creator in PNG — you can use them for designing in your favorite editing software! 5 individual layers used in Wreath Creator in PNG — you can use them for designing in your favorite editing software! All PNG files have transparent backgrounds and 300 DPI. Can a designer draw any graphic from scratch? Mostly, yes. Should he? It can be counterproductive, will take too much unnecessary time. This is why almost all the graphic designers make use of ready-made graphics components – blend these graphic components, adjust them and create the design . Noone is going to buy these parts one at a time, so that’s why they are put together into graphic packages and marketed as a singular product. The way to spend significantly less bucks on MasterBundles.com bundles? You can make the MasterBundles items cheaper. Yeah, I know they are already cheap, but there’s still place to save. If you share this webpage via social websites – you immediately receive the 5% price reduction for the graphic bundles you prefer. That’s a very easy way to get a professionally created tools cheaper. The benefits of graphic packages for graphic designers are pretty obvious. However if you are new to those elements and now have questions, the following info will be useful for you. Along with a multitude of the elements in a single pack, the selection gives you a chance to use different of them for a number of tasks. Besides, the price is usually greatly reduced which lets you save some money, yet get the complete set valued for hundreds or thousands of dollars. Considering that all the packages differ from one to another, each individual graphic designer will find the required selection for a unique project. Researching them you will uncover the selections including illustration swatches, business cards, social media infographics, UI kits, and much more. At MasterBundles , you can find more than 450 graphic bundle deals to choose from. MasterBundles.com could offer you a large variety of unique products. MasterBundles.com markets not just graphics bundles but also roughly 20 other different types of items. Fonts, WordPress themes, mockups, icons, photos, illustrations, presentation templates and a lot more – on the MasterBundles.com you’ll be able to find all of the products, required for a design. If you need infographics for the future presentation in any kind of businesses from social media and marketing to medical care and education, the package is right what you have been hunting for. Using the infographics package deal you will find yourself not wasting time which is important in terms of efficiency. Every element is available in an individual file which can be customized in Photoshop, Illustrator, Keynote or Powerpoint. You thought all you need to create a popular and prosperous Instagram account is merely to submit a few nice photos? To attract followers, your Instagram feed should look gorgeous . Instagram templates will help you to reach that goal and help to make your Instagram posts appealing and recognizable. Accumulated into packages they could be ordered for a lower price. One more package well suited for photo designers is part of photo bundles. On MasterBundles you will discover a bulk of goods for photo retouching. If you need Lightroom presets, PS actions, photo overlays, or other resources for working with photos, you have come to the right place. The watercolor graphics package can be described as a package made up of images and illustrations designed with watercolors. They’ll come in handy for a range of companies, such as food distributors, fashion and perfume. Wedding invites or cards is also designed with this bundle. MasterBundles is a website that accumulates top rated offers from over the internet and allows you to purchase the design components you need in your work for for less money. Bundles this site sells are restricted in time, and that’s the reason they are so inexpensive. MasterBundles.com boasts a big blog with the unique design news and features described. Should you be looking for a website full of excellent deals – MasterBundles is there for you!